The Kalahari Scrub-Robin is a Southern African bird that belongs to the Muscicapidae bird family group which includes birds such as Thrushes, Robins, Chats, Old World Flycatchers. 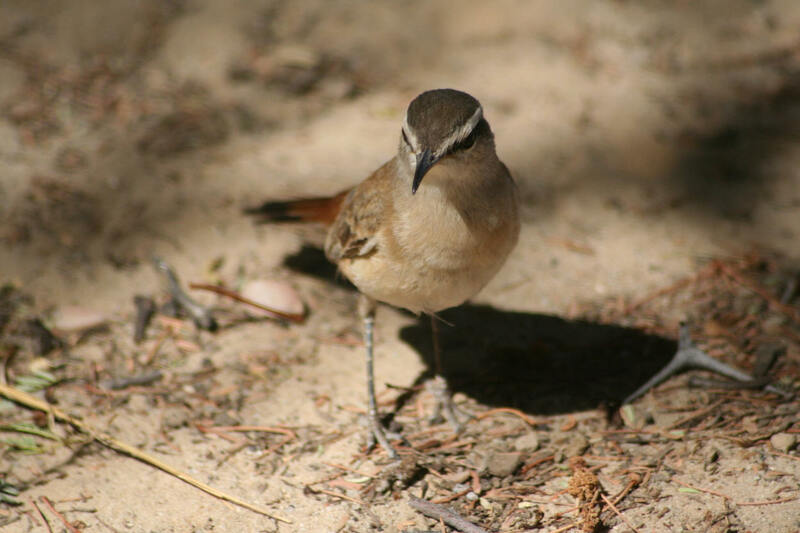 The description for the Kalahari Scrub-Robin (Latin name Cercotrichas paena) can be found in the 7th Edition of the Roberts Birds of Southern Africa. The Cercotrichas paena can be quickly identified by its unique Roberts identification number of 615 and the detailed description of this bird is on page 940. 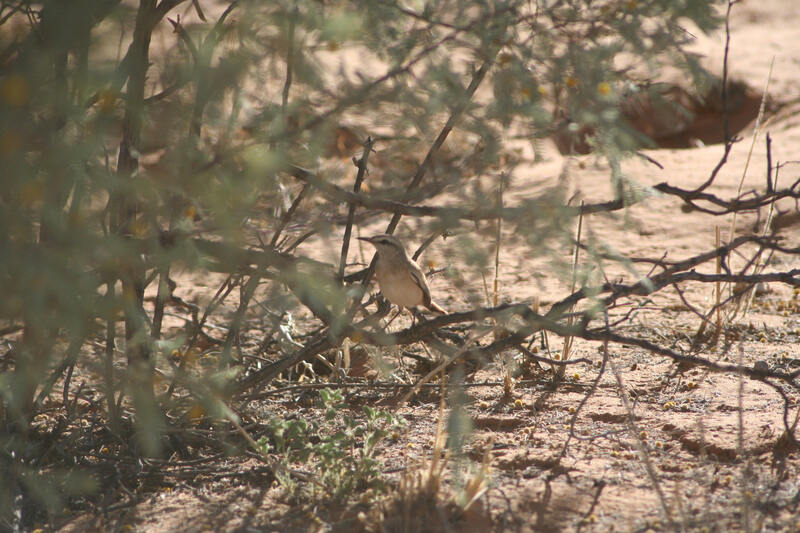 You will find a picture of the Kalahari Scrub-Robin on page 800. 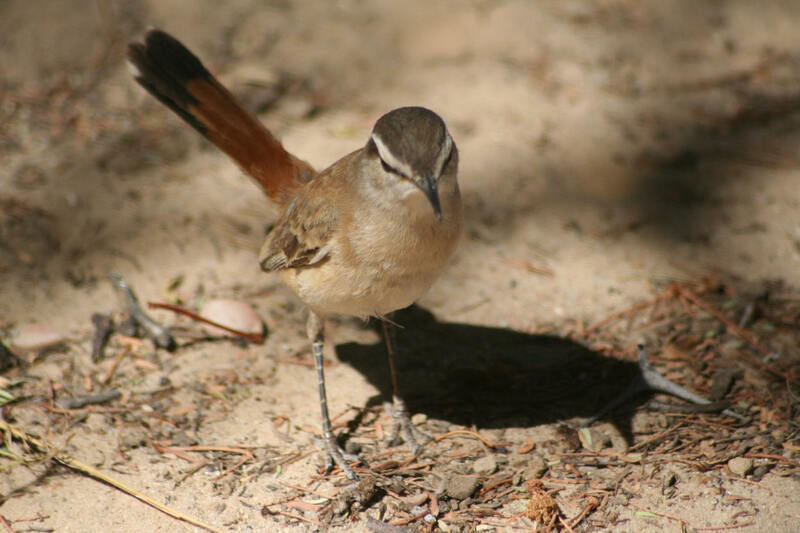 This bird is known as Kalahari Robin in the Roberts 6th Edition. The Latin name for this bird is Erythropygia paena in the Roberts 6th Edition. The Kalahari Scrub-Robin is known in Afrikaans as Kalahariwipstert. The Kalahari Scrub-Robin is near Endemic to the Southern African Region which means it is mainly found in this region but is not restricted here alone. The Cercotrichas paena can be found in other parts of the world. The Kalahari Scrub-Robin has a height of 16 cms and weighs around 20 gms. The head is coloured grey, brown while the bill is coloured black. The Cercotrichas paena has a white coloured throat, grey, black legs and a grey coloured back. The eyes are brown. The Cercotrichas paena forages mainly on the ground or at the base of trees, and low down in the shrubs eating mostly fruits and seeds. The Kalahari Scrub-Robin is a monogamous bird which means that the bird finds and breeds with one partner for the rest of its life. The bird lays between 2 to 4 eggs and they are coloured white. The bird builds its nest on the ground with figs, straw and leaves. The nest is placed under a bush to protect the young from predators. The bird is mainly found in the Savanna grasslands where it breeds and feeds. The Kalahari Scrub-Robin is mainly seen singly or in pairs in the wild. It is also seen in flocks.